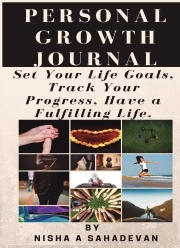 Description of "Personal Growth Journal"
You will set goals for whole twelve areas of life as part of your Life Goals Section. This Journal assists you to set yearly, monthly and weekly goals. You will also find prompts to do periodic reviews of your goals. Daily Journal prompts not only help you focus on your goals, but also make your daily life filled with gratitude, joy, and learning. Reviews of "Personal Growth Journal"